Once you order: It will be process with in 2 Business Day, and we ship out package by usps First Class or Priority Mail with in USA address. Once usps truck picks up it will take 2-4 business day for delivery. All our package get ship out with tracking number so you can keep an eye on it. If the package get lost we'll send you another one, we feel customer satisfaction is our number one priority. Refund, Returns and Cancellation Policies: Any of our products defective we'll exchange it for you or full money back. All you have to do is send the defective disc back to our return address with order number and note what?? ?s wrong with the disc. Customer satisfaction is our most important so please before leaving us bad feedback gives us a chance to fix the problem, I believe anything can be workable. Welcome to Uni Love Shopping Mall: We been in Anime business over 15 years. Uni Love Shopping LLC offers a unique variety of high quality Japan Anime DVDs, by category. Shop securely for your favorite gifts. All orders are shipped within 2 Days, and all merchandise is guaranteed or your money back! Shopping at Uni Love Shopping LLC is fast, easy and secure! We are marketing a desirable Quality Merchandise & Anime product, that our company has a sincere commitment to customer satisfaction. '""Continuing from where the first film left off, Wing Chun master Ip Man and his family move to Hong Kong in the early 1950s after their escape from the Japanese. There, he desires to open a school to propagate his art, as well as make his living, but he has difficulty attracting students due to his lack of reputation in the city. One day, a young man named Wong Leung appears and promptly challenges Ip to a fight, but is easily defeated. Wong leaves humiliated, only to return with some friends to gang up on him. Ip beats them as well. Stunned and impressed by his skills, Wong and his friends become his first students, bringing more disciples to help the school thrive. Wong is later caught pasting promotion leaflets for the school by some Hung Ga students. One of them challenges Wong to a fight and loses, but his friends take Wong hostage in revenge, hoping to ransom him. Ip receives word of the kidnapping and goes to the local wet market as appointed, but the meeting ends in a confrontation with a growing mob of Hung Ga students. Ip and Wong fight their way outside to meet Jin Shanzhao ' the martial artist and former bandit in the first film ' who comes to their rescue with his own gang. The students' master, Hung Chun-nam, arrives to break up the fight. Ip introduces himself, and Hung informs him that to set up his own school, he must be subjected to a ceremony where he must be challenged by the city's Kung Fu masters. Ip, Wong and Jin are subsequently arrested by Fatso for disturbing the peace, but they each manage to make bail and are released. Hung and Fatso are then shown to be acting as reluctant collectors for the martial arts schools (including Hung's) as part of a protection racket headed by Superintendent Wallace, a corrupt officer in the Hong Kong police. Ip attends the ceremony and defeats his first challengers, and then strikes a draw with the last challenger, Hung. Ip is allowed to keep running his school on the condition that he pay the monthly protection fees, but he declines. Hung thus has his students loiter in front of the Wing Chun school and harass anyone interested, causing a street brawl between them and Ip's disciples. Ip is thus forced to close up and move the school nearer to home. He soon confronts Hung for his bullying and their respective views on integrity, then nearly engage in another fight before being interrupted by Hung's family. Ip respectfully leaves, and the next day, Hung invites him to a British boxing match he had helped to set up, quietly coming to terms with him. The boxing competition begins with the various martial art schools demonstrating their skills. However, the event's star boxer, Taylor """"The Twister"""" Milos, openly insults and attacks the students, causing chaos as the masters try to restore order. Hung accepts Twister's challenge to a fight so that he can defend his culture's honor. At the start, Hung has trouble hurting his opponent and begins to weaken from asthma, causing him to get severely battered. Although Ip tries to persuade Hung to stop the fight, the latter remained stubborn until he is finally beaten to death by Twister. News of Hung's death rapidly spread throughout the enraged Chinese populace, causing a scandal that spurs Wallace to hold a press conference, where he states that Hung's death was an accident, and Twister announces that he will accept any challenge from the Chinese. Ip arrives and accepts the challenge. As Wing-sing goes into labor, Ip finishes training and begins his fight with Twister; Ip manages to trade blows with the boxer but like Hung, he is knocked down several times. After the judges ban kicks in the middle of the bout, Ip takes several more hard blows and is knocked down again. Upon getting up, he recalls the advice he offered Hung regarding Twister's weak points, and with a flurry of his own blows (mixed in with Hung's own techniques), he strikes Twister's vulnerable biceps and ribs, and then brutally knocks out his opponent. While the Chinese audience cheers, Wallace is arrested by his superiors, thanks to information provided by Fatso. Ip then gives a speech to the British audience, stating that despite the differences between their peoples, he wishes for everyone to respect one another. Ip goes home and reunites with his family, with Wing-sing having successfully given birth to their second child. A final scene shows Ip being introduced to a boy who wishes to study Wing Chun: Bruce Lee. Ip smiles and simply tells the boy to come back when he is older. 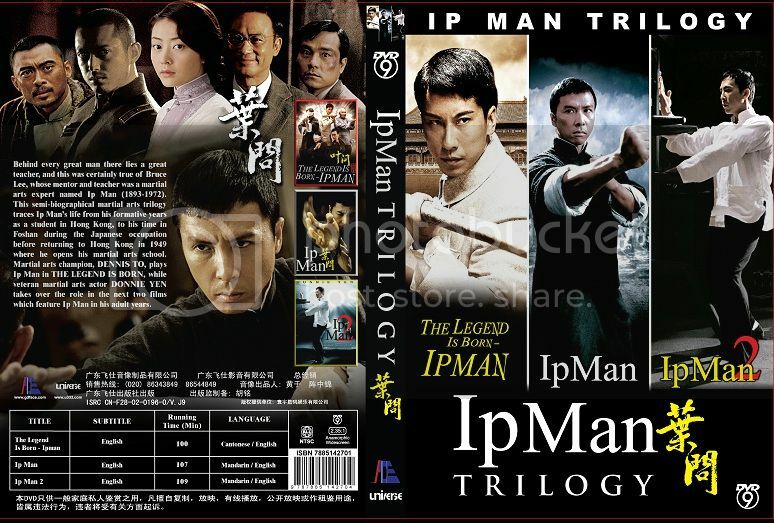 '""Legend Is Born - Ip Man"" serves as a prequel to Ip Man's life before becoming the Master of Wing Chun. It depicts Ip Man's (Dennis To Yu-Hang) younger days in Hong Kong as a student, and returning to Foshan, China, where he spends his formative years.